One of my favorite sayings of all time is this: “If you keep doin’ what you’re doin’… you’ll keep gettin’ what you’re gettin’!” It applies to your business just as much as it applies to everyday life. Don’t forget that you have two kinds of clients… first-time clients and repeat Most sales efforts are directed at finding first-timers… but retaining existing clients – in addition to being much easier and less expensive than hunting for new business – is the only path to a truly successful business. So, think about how you’ll go after each of these two groups. If you’re like every other business on the face of the planet… you’ve lost a client or two (or 10 or 100) over the years. In 2016, commit to picking up the phone once a week (at a minimum) and calling one of those ex-clients to try to re-ignite the relationship. What have you got to lose? In an industry that generally does not embrace sales, remember this… “Seek first to help, then to sell.” Think about providing some kind of value to sales prospects – before you begin selling – that will help them to overcome the initial hurdle of you being a “salesman.” Get creative. Maybe ‘clip an article’ and send it to them… forward a copy of your latest white paper… offer to deliver a lunch-n-learn to their team, etc. No sales prospect ever agrees to become a client on the first contact. There is always some level of ‘nurturing’ that’s necessary. Rather than relying only on email for your nurturing in 2016, pick up the phone occasionally and talk with your prospects. Remember… no one will buy from you until they get to “know you… like you… trust you.” And phone calls can help accelerate that process. Are you as part-time sales rep? Most in our industry are. To be successful at sales, you can’t just “get to it when I have time.” You must be proactive. So, next year, commit to blocking off some time once a day or once a week and doing nothing but working on sales. It takes 21 times for something to become a habit… so stick with it – you’ll be glad you did! ABYN – Always Build Your Network. Like blocking off time regularly to work on sales (#5 above), block off a little time each week to build your network. And it’s just too easy with LinkedIn. Set a goal, too… e.g. “I will add 5 new LinkedIn connections this week.” And please… DO NOT use the generic invitation that comes with the platform. Hint: make these into big charts and post them on the wall. This visual reinforcement is a powerful motivator. Does the typical slide in your capabilities presentation have 10 bullet points with 20 words for each bullet? Do you generally stand at the front of the room, when presenting, and read your slides verbatim? Stop it already! It’s time to update your capabilities presentation. First, create a visually interesting PowerPoint… heavy on the imagery, light on the words. Then, practice delivering the presentation (no reading word-for-word… just tell your story) – so YOU become the star of the show. Stop cold calling! Cold calling is a lose-lose-lose proposition. 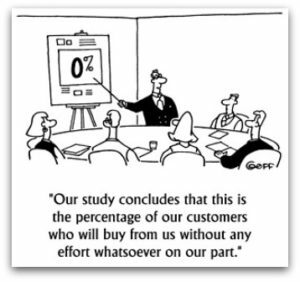 First of all, 99% of all salespeople simply hate doing it… and as such, they’re really bad at it. Secondly, 99% of all potential clients hate receiving cold sales calls – they’re interruptive and irritating (The other 1%? You got lucky!). Finally, because of those two factors… cold calling is one of the least productive things a sales rep can do. Instead, work with management to initiate some inbound marketing activities that generate inquiries and deliver solid sales leads… then your job becomes one of follow-up. There are all kinds of sales tips that could be included in this post. The point is this… as a way to accelerate sales in 2016, you have to do something new. So, pick one or two… and get started. Good luck and good selling. Got an interesting or unique sales tip that works for you? We’d love for you to share it below.